There is a reason I chose ‘date parties’ as my theme which I will get to in a second. 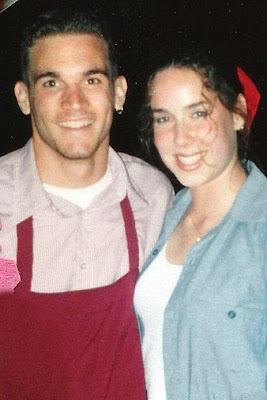 Here are a couple date parties from college where James and I had to dress up. Seriously, I have tons of pictures from formals and date parties in college! 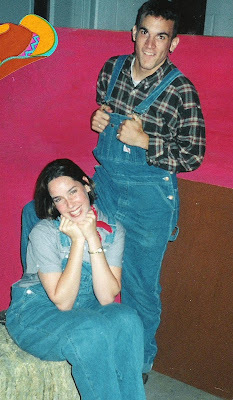 James was in BYX (Brothers Under Christ) and I was in ASC (Aggie Sisters for Christ) at A&M so that generated a lot of silly themed date parties! Now this next date party picture is significant. This was the BYX E.R. 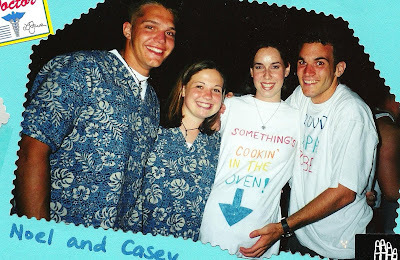 date party in April of 1999 and it was my ‘brilliant’ idea to dress as a very pregnant wife about to give birth. Cute idea, right? Well, James broke up with me about 2 weeks later for 7 months. Now, this date party costume definitely was not to blame, but I couldn’t help but think how stupid I was after the fact! You can almost see the look of fear in James eyes in this picture! Like, “What the heck? Julie looking pregnant is freaking me out!!! !” 🙂 Anyway, another reason this picture is significant is the guy in the picture with us, Noel Johnson. He is one of our best friends from college. He is going to be on a Travel Channel reality show tomorrow night called America’s Worst Driver. So fun! (9 p.m. central time) We are very excited to watch him and we hope you will watch too! James is my HUSBAND in this picture and I let him bleach his hair AGAIN! 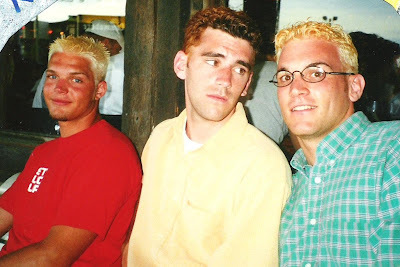 I love your flashback Friday idea! It is inspiring me to do something similar next year with my students on Fridays where they can learn about something from the past (like a “this day in history thing” but with something cool:) Thanks for the idea!